Beyonce performs during the Global Citizen Festival: Mandela 100 at FNB Stadium on December 2, 2018 in Johannesburg, South Africa. (Photo by Raven Varona/Parkwood/PictureGroup). Queen Bey did not disappoint rocking outfits connecting to the continent while performing at 'Global Citizen Festival: Mandela 100.' Here are our favorite looks. All eyes were on the Global Citizen Festival: Mandela 100 on Sunday at FNB Stadium in Johannesburg. Presented by the Motsepe Foundation and in partnership with House of Mandela, Cassper Nyovest, D'Banj, Ed Sheeran, Eddie Vedder, Femi Kuti, Kacey Musgraves, Pharrell Williams, Chris Martin, Sho Madjozi, Tiwa Savage, Usher and Wizkid vibed with an stadium full of participants who took action, responding to Nelson Mandela's call to be the generation to end extreme poverty. Those in attendance and those who were watching via the festival's various livestream feeds anticipated none other than Beyoncé and JAY-Z to close out the show with a bang—and they did so in style. 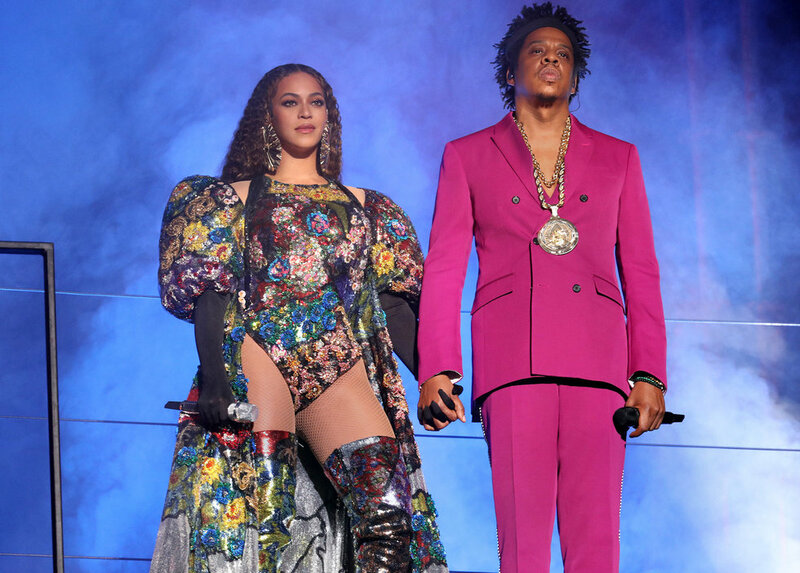 Beyoncé was styled by none other than Zerina Akers, who did her due diligence to source her looks locally and made sure that each outfit had a connection to the continent—like her opening ensemble designed by Mary Katrantzou. According to Beyoncé's mother Tina Lawson, her coat, full of intricate beading a sequins, have all 54 African countries mapped out on it. More details from the designer here. Akers also decked Queen Bey out in an ancient-Egyptian inspired beaded bodysuit adorned with hieroglyphs and another ensemble full of colorful beads designed similarly to traditional Zulu jewelry—both by BALMAIN. What took many folks' breath away during the performance was her Zulu rendition of "Halo" with the Soweto Choir. Multimedia visual artist Trevor Stuurman, a panelist on OkayAfrica and Global Citizen's The Next 100 Summit, captured the moment as a photographer on Beyoncé's team for the festival. Ms. Carter dons an emerald green outfit made in collaboration by South African designers Enhle Mbali Maphumulo of Manual Rossa Apparel and Quiteria & George. ICYMI, catch the bit of her closing set that was livestreamed with JAY-Z below.